The SanDisk SD Card is a highly secure stamp-sized flash memory card. The SD Card weighs approximately two grams. The SD Card can be used in a variety of digital products, digital cameras, trail cameras and more. This pack features a 4GB Class 4 SD card, which conforms to the SD 2.00 specification (rated Class 4 for speed and performance). 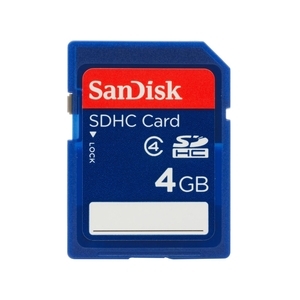 The SDHC Card features a 15MB/s write speed and also contains a security feature for the protection of copyrighted data.